3 Lab Report Title Page Question Exceeds Standard Meets Standard Nearly Meets Standard Does Meet Standard No Evidence Missing 1 component Missing 2 4 components Missing more than 4 components Contains: Title Your Name, Teacher s Name, Course Period, Date, Neatly finished-no errors Clear and concise problem stated that is testable. Hypothesis Follows if then because Clearly defines controls vs. variables in if portion. Predicts with correct facts. Materials Lists all materials and Procedure Lists all steps in a detailed, sequential order that are easily followed. All safety precautions and warnings are Provides diagrams of all set Results All data is recorded and organized in a clear manner. All visible observations are Complete and correct analysis of data is Errors of Experimentation are Conclusion Restates the hypothesis, supports or refutes it and explains the role of the test in making the decision Mechanics No errors in punctuation, Identifies the question in an unclear manner, but is still testable. Follows if then because Defines controls vs. variables in if portion in an unclear manner. Predicts with correct facts Lists most materials and Lists all steps in a sequential order that are not easily followed. All safety precautions and warnings are Provides diagrams of all set All data is recorded and organized in a clear manner. All visible observations are Analysis of data is provided with a few errors. Errors of experimentation are Restates the hypothesis and supports or refutes it punctuation, capitalization and spelling. Identifies only part of the question, but is still testable Follows if then because Defines controls vs. variables in if portion in an unclear manner. Predicts with some facts. Lists some of the materials & Lists all steps in a sequential order that are not easily followed. All safety precautions and warnings are missing. Provides some diagrams of set All data is recorded and organized in a clear manner. Visible observations are missing. Analysis of data is provided with a few errors. Errors of experimentation are Supports or refutes the hypothesis without restating it Many errors in punctuation, The question is not testable no matter how clear and concise the question is. Follows if then because Defines controls vs. variables in if portion in an unclear manner. Predicts with no facts Lists wrong materials or Lists steps in an order that are not sequential, not easily followed, or incomplete. Some safety precautions and warnings are not Provides some diagrams of set Incorrect data is provided regardless of inclusion or presentation of all other criteria. Does not address the hypothesis errors in punctuation, Score Usage No errors sentence structure sentence Many errors in sentence errors in sentence structure and word usage. 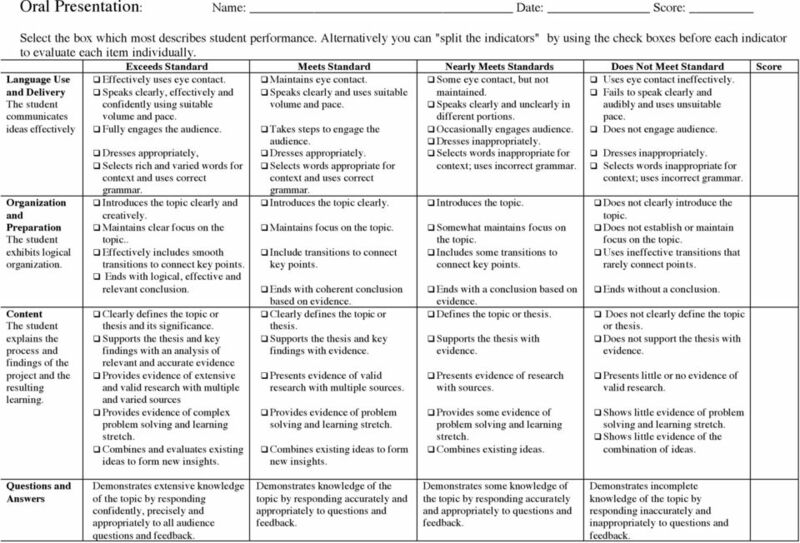 4 Oral Presentation: Select the box which most describes student performance. Alternatively you can "split the indicators" by using the check boxes before each indicator to evaluate each item individually. Language Use and Delivery The student communicates ideas effectively Organization and Preparation The student exhibits logical Content The student explains the process and findings of the project and the resulting Exceeds Standard Meets Standard Nearly Meets Standards Does Meet Standard Score Maintains eye contact. Speaks clearly and uses suitable volume and pace. Effectively uses eye contact. Speaks clearly, effectively and confidently using suitable volume and pace. Fully engages the audience. Dresses appropriately, Selects rich and varied words for context and uses correct grammar. Introduces the topic clearly and creatively. Maintains clear focus on the topic.. Effectively includes smooth transitions to connect key points. Ends with logical, effective and relevant conclusion. Clearly defines the topic or thesis and its significance. Supports the thesis and key findings with an analysis of relevant and accurate evidence Provides evidence of extensive and valid research with multiple and varied sources Provides evidence of complex problem solving and learning stretch. Combines and evaluates existing ideas to form new insights. Takes steps to engage the audience. Dresses appropriately. Selects words appropriate for context and uses correct grammar. Introduces the topic clearly. Maintains focus on the topic. Include transitions to connect key points. Ends with coherent conclusion based on evidence. Clearly defines the topic or thesis. Supports the thesis and key findings with evidence. Presents evidence of valid research with multiple sources. Provides evidence of problem solving and learning stretch. Combines existing ideas to form new insights. Some eye contact, but not maintained. Speaks clearly and unclearly in different portions. Occasionally engages audience. Dresses inappropriately. Selects words inappropriate for context; uses incorrect grammar. Introduces the topic. Somewhat maintains focus on the topic. Includes some transitions to connect key points. Ends with a conclusion based on evidence. Defines the topic or thesis. Supports the thesis with evidence. Presents evidence of research with sources. Provides some evidence of problem solving and learning stretch. Combines existing ideas. Uses eye contact ineffectively. Fails to speak clearly and audibly and uses unsuitable pace. Does not engage audience. Dresses inappropriately. Selects words inappropriate for context; uses incorrect grammar. Does not clearly introduce the topic. Does not establish or maintain focus on the topic. Uses ineffective transitions that rarely connect points. Ends without a conclusion. Does not clearly define the topic or thesis. Does not support the thesis with evidence. Presents little or no evidence of valid research. Shows little evidence of problem solving and learning stretch. Shows little evidence of the combination of ideas. Questions and Answers Demonstrates extensive knowledge of the topic by responding confidently, precisely and appropriately to all audience questions and feedback. Demonstrates knowledge of the topic by responding accurately and appropriately to questions and feedback. Demonstrates some knowledge of the topic by responding accurately and appropriately to questions and feedback. Demonstrates incomplete knowledge of the topic by responding inaccurately and inappropriately to questions and feedback. 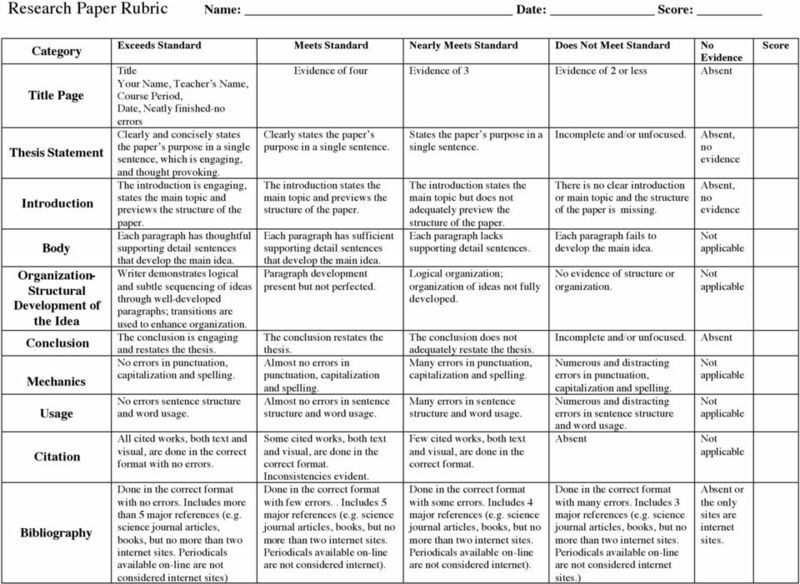 5 Backboard Clarity of Topic Details of Research Effectiveness Quality Exceeds Standard Meets Standard Nearly Meets Standard Does Meet Standard No Evidence Score Includes a clear title which Includes a title which Includes a title that gives Missing a title or present gives specific information gives information about some information about statement of the main about main topic. the main topic. the main topic. topic. Includes all details from research and has clear labels, phrases, or sentence descriptions. Viewer has a thorough understanding of topic includes specific examples and/or illustrations in an organized manner. Includes illustrations and labels. Content is edited for spelling and punctuation and has no errors. Includes most details from research and has clear labels or phrases. Viewer has an understanding of the topic includes examples and /or illustrations. Includes illustrations and labels. Content is edited for spelling and punctuation and has less than 3 errors. Includes some details from research and has labels or phrases. Viewer has some understanding of the topic includes some examples and/or illustrations. Includes illustrations and labels. Content is not edited for spelling and punctuation and has more than 3 errors. Includes only a few details from research using labels or phrases. Viewer has difficulty understanding topic includes few examples and/or illustrations. Does not include illustrations and labels and/or contains more than 3 errors in spelling and punctuation. No details from research. Backboard does not communicate topic researched. Work is haphazard and careless. Has none of the required elements. (5) Problems are translated into proper mathematical forms which are ready to be solved. 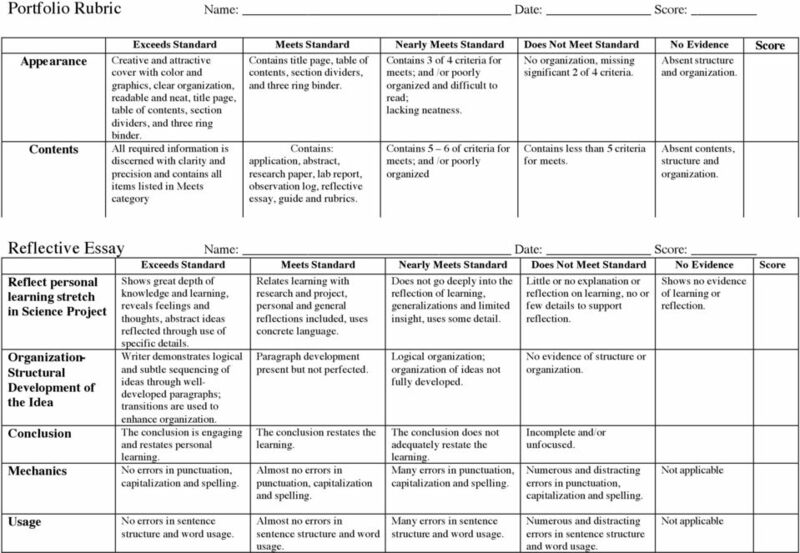 ASSESSMENT PLAN. Department of Marketing. College of Business Illinois State University. Integrated Marketing Communication Sequence. Allow a few minutes for editing. All Pre- AP science students are required to select one Topic Menu for their science project. Students will then decide on the type of project they are interested in doing, within the menu of their selection. 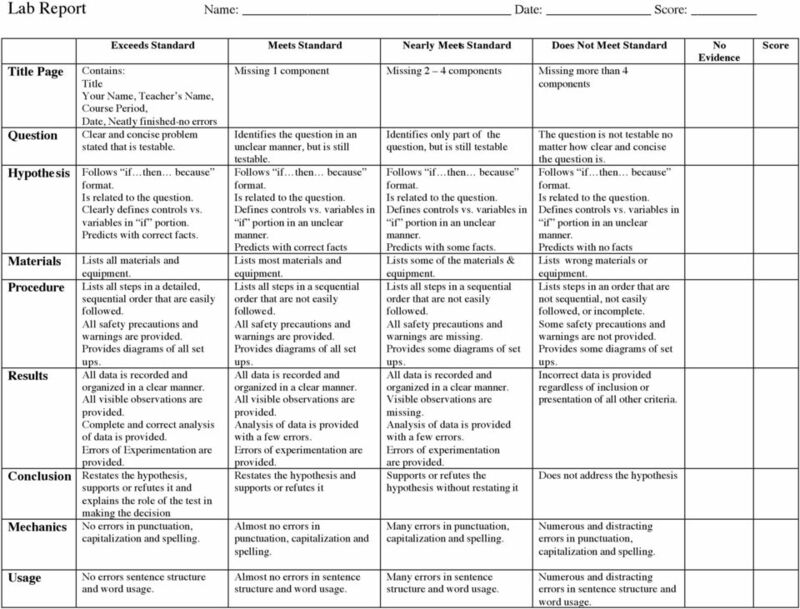 Teacher Work Sample: Assessment Plan TWS Standard The teacher uses multiple assessment modes and approaches aligned with learning goals to assess student learning before, during, and after instruction.